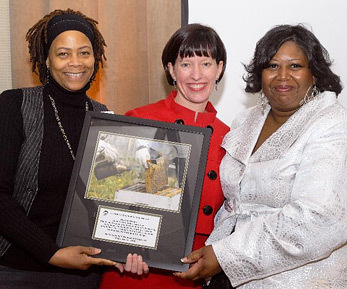 Heather Steans is presented with the Creating a Community that Works award by the North Lawndale Employment Network at the 5th annual Sweet Beginnings Tea, Friday, February 12th. Heather was honored for her leadership in passage of Public Act 96-0126, L3C (low-profit limited liability company) legislation which brings this promising model of investment for Illinois social enterprises. Illinois is one of six states which have recently pushed for L3C legislation. L3C is a type of limited liability company (LLC) designed to attract private investments and philanthropic capital in ventures designed to provide a social benefit. Limited liability corporations such as Sweet Beginnings will benefit from the expanded opportunities for investment that the L3C legislation offers. This report presents key juvenile justice data in the North Lawndale community. North Lawndale is notorious for the number of its youth who are in trouble with the law. Living next door to the largest juvenile jail in the nation, many of Lawndale's youth find themselves swept into the juvenile legal system.